Welcome to another one of our pen reviews! This time, we are joined by our second guest reviewer and she is also our first left-handed guest, Roz Hung. Roz is a techie by profession and enjoys writing and sketching as well. She’s always admired fountain pens but was afraid to use them until Pam took her under her wing less than a year ago. Pam let her write with a few pens to see what she might like and own. Roz primarily uses her fountain pens for journaling, and scheduling on her planner. Currently, she’s also using her pens to sketch and doodle for Inktober and tries to keep up with the daily prompts for October. When Roz isn’t busy writing or drawing, she spends her time baking in the kitchen. Thank you for joining the fun and helping us out Roz! 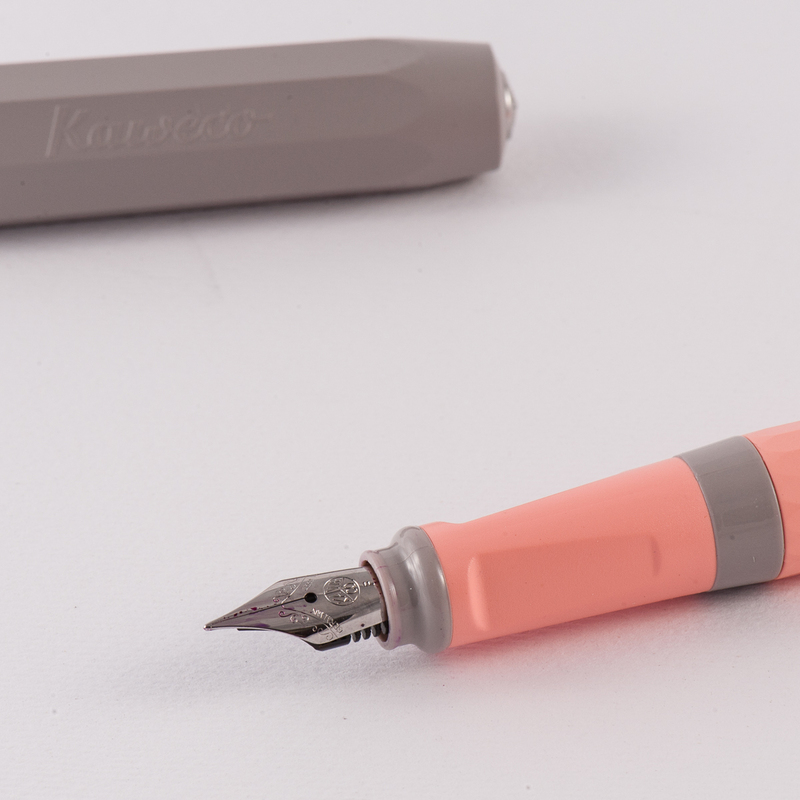 Roz: My first impression of the Kaweco Perkeo was how attractive and friendly its colors were. While the colors are solid and the pen has no sheen or gloss to it, I think the facets really give it a subtle eye catching quality. Katherine: The Perkeo is a little weird to me. My initial reaction was “ooooh facets!” then “hm… the facets on the body and cap are different…” I like the colors overall, but have clear favorites. Pam: The Perkeo has a design that will appeal to both children and adults. 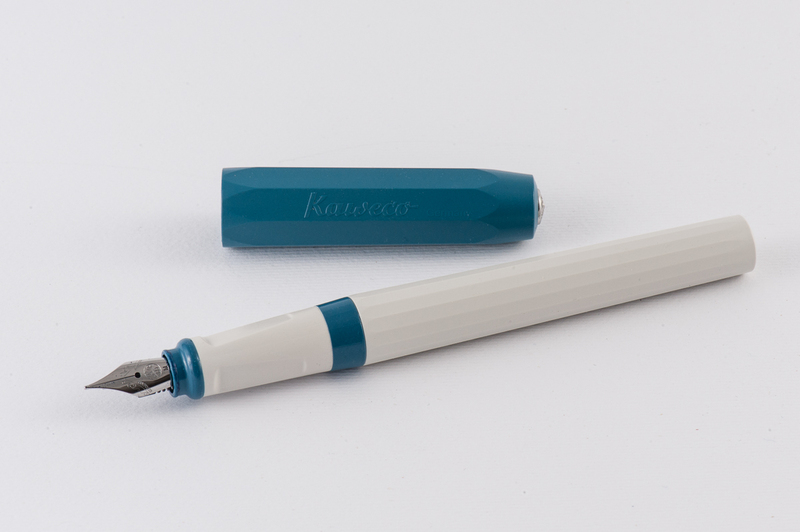 The cap of the Perkeo heralds back to the beloved Kaweco Sports that we all know and love. The colors are eye catching and pretty sophisticated, in my opinion. 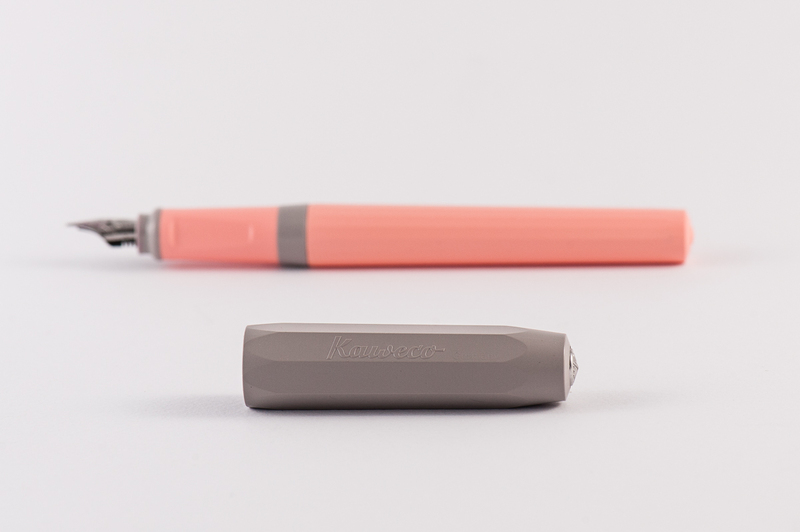 The faceted body is an ode to Kaweco’s overall aesthetics. I am really impressed by this starter pen. 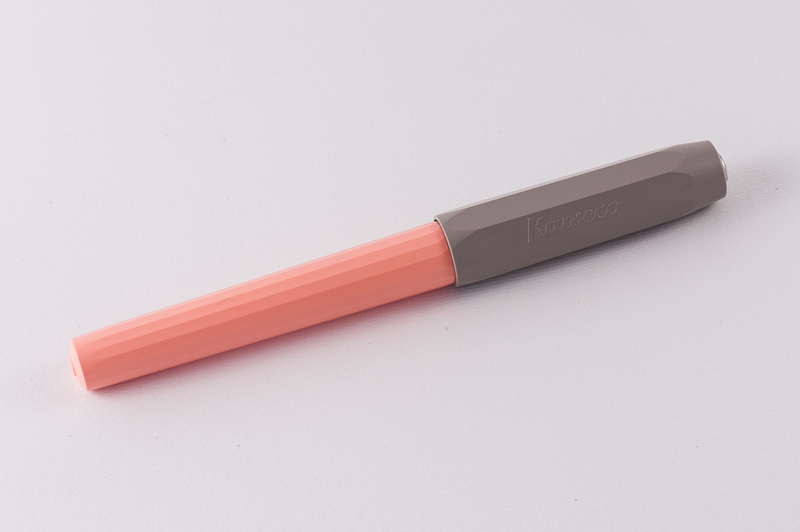 Franz: These Kaweco Perkeo pens fascinate me. 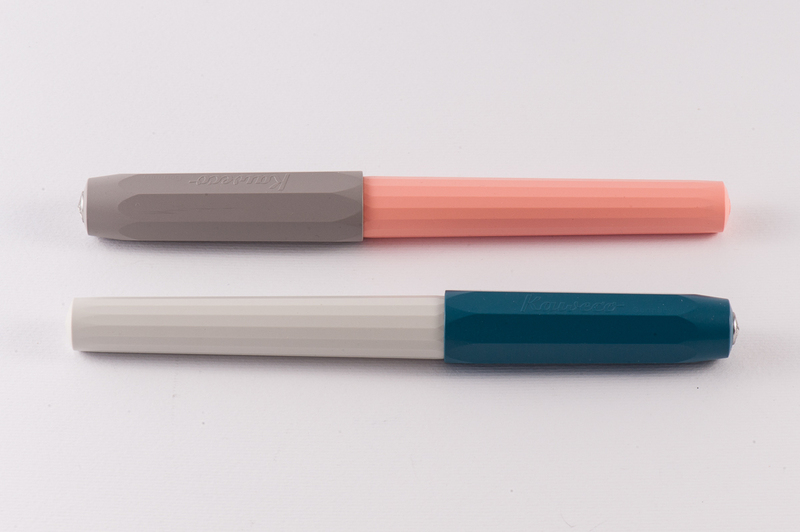 It is a substantial pen compared to the Kaweco Sport and the colors may be subdued but at the same time they are enthralling. 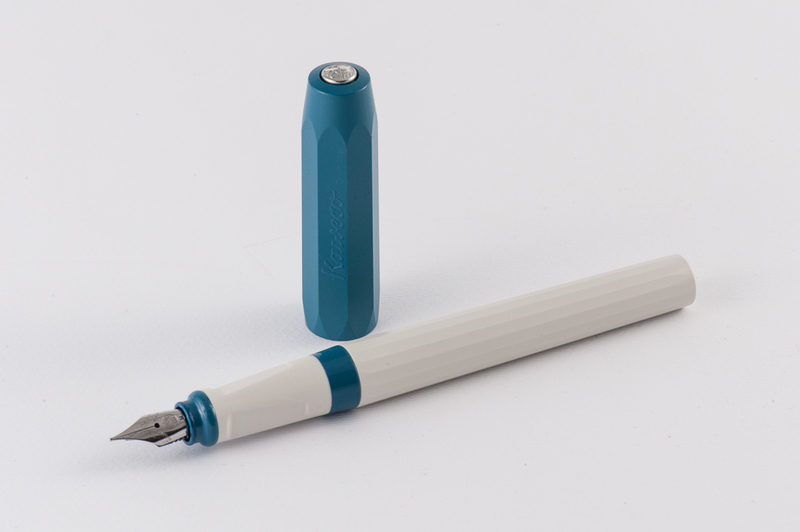 The fine facets of the barrel makes it an elegant looking pen and makes the Perkeo stand out. The Perkeo currently has four finishes: Indian Summer (black and yellow green), Bad Taste (pink and black), Cotton Candy (light pink and gray), and Old Chambray (white and light blue). 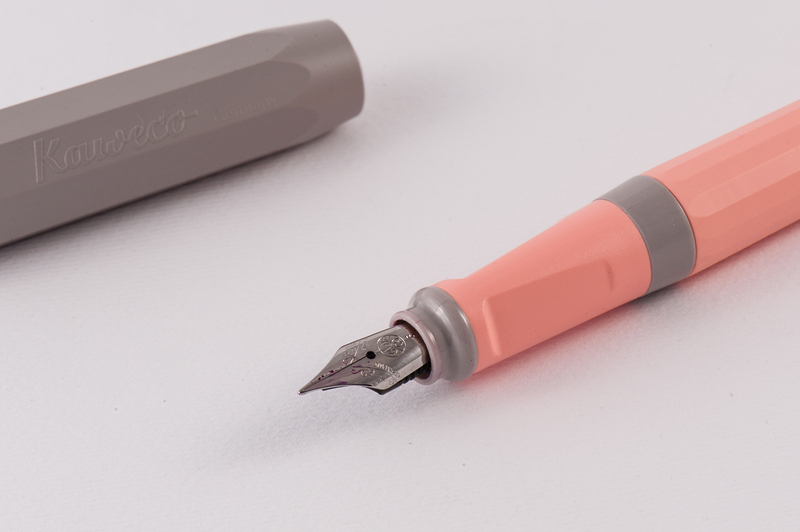 As we expressed above, the Perkeo’s finishes are captivating and I’d like to add that Kaweco’s naming of these colors are equally intriguing. The Indian Summer and Bad Taste are both supplied with a black steel nib, and black finial. And both the Cotton Candy, and Old Chambray sports a chrome steel nib, and chrome finial. Note: The Perkeo pen we used for the In the Hand photos above was the Indian Summer finish. During our review process, we focused on using Katherine’s Cotton Candy Perkeo shown below. Roz: I admit at the top of my lungs that I know nothing about nibs! However, I liked the line width of the Kaweco’s nib and I only needed to make minor adjustments to my horizontal tilt for a smooth writing experience. 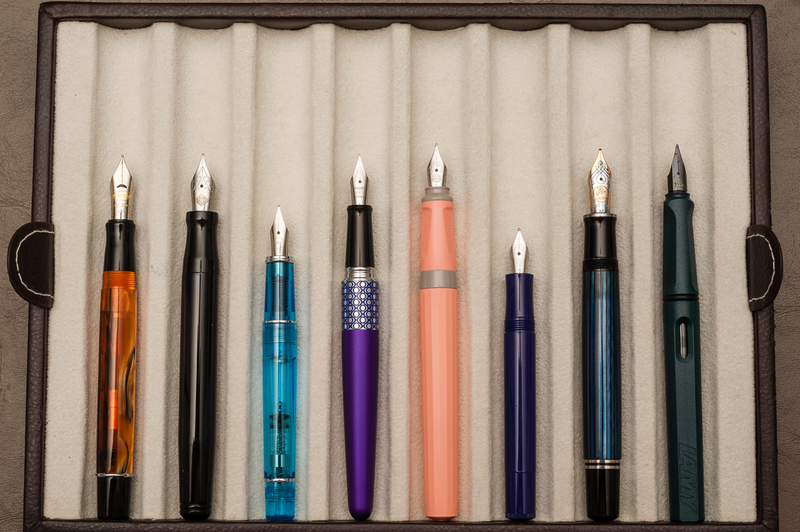 Katherine: The variability on these nibs is surprising — my boyfriend and I each own one, and mine writes like a dry EF, and his writes like a wet Fine, even when inked with the same ink. Both are smooth and decent writers, but the variability in flow and tipping was surprising! Pam: For the times I “crave” for a “chubby” line width, I gravitate towards a Kaweco EF nib. What I love about the Kaweco EF nib is that it creates a very round line that can sometimes compliment my writing style. The ones that Katherine had were F nibs. Unsurprisingly, they wrote well out of the box with no issues for me. However, between the two pens that Katherine had for us to try out, I did notice a difference in the line width despite both pens being marked as F. One was drier than expected and the other flowed quite well. Aesthetically, the nib seems to be disproportionally too petite for a “regular” sized pen. Or maybe that’s just me. Franz: The nib on this Perkeo wrote with a very thin line width but it wrote immediately and quite smooth with minimal feedback for a fine nib. 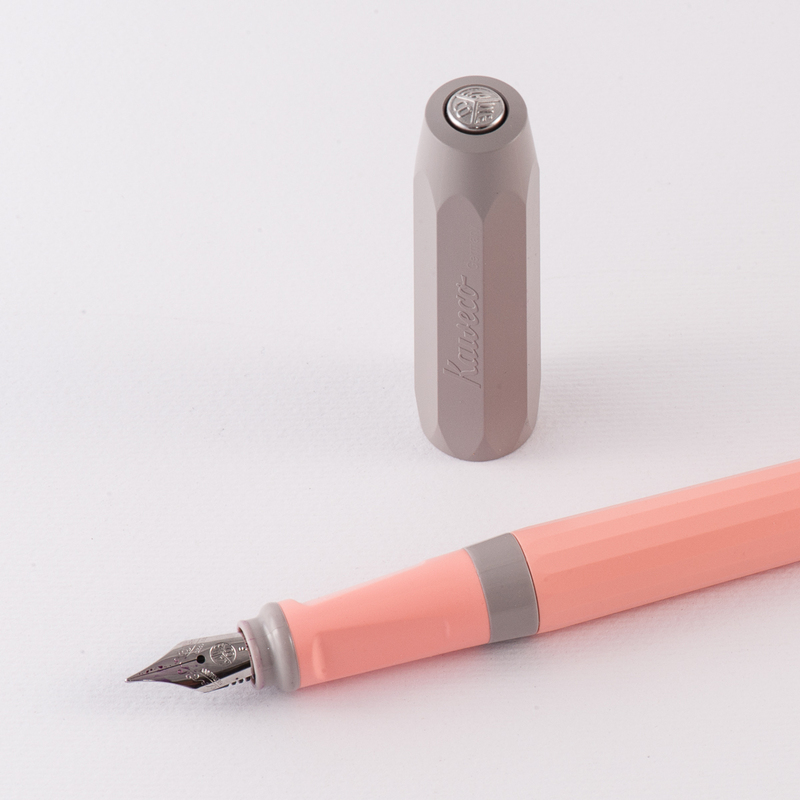 Visually, the nib is very slightly recessed and I initially thought that the nib was the same that Kaweco uses for the Sport model but I believe I was wrong. 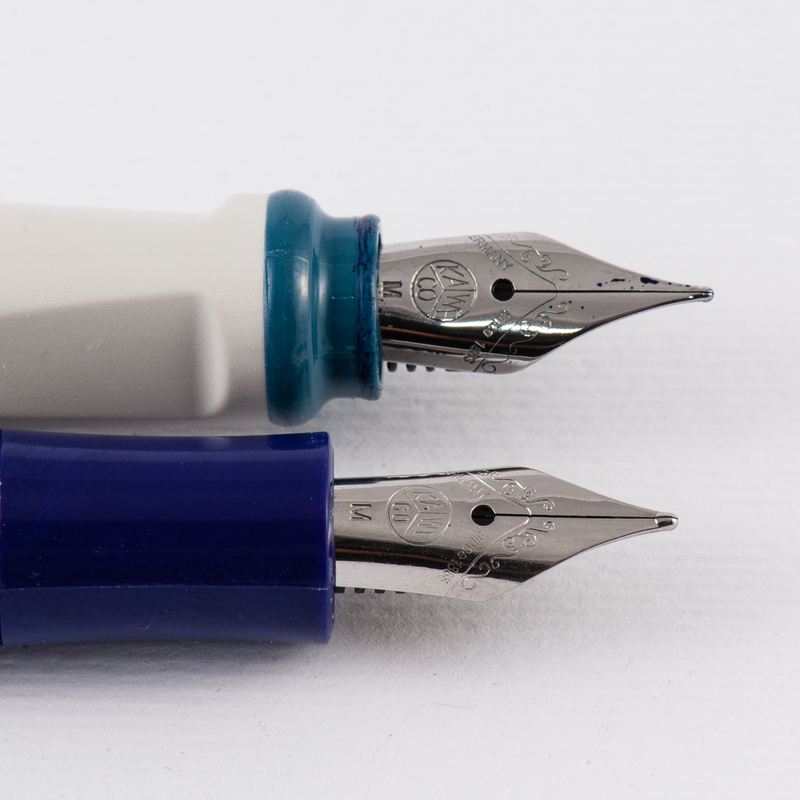 Side-by-side, the Perkeo nib is a size bigger than the nib on the Sport. The Perkeo is inked via a cartridge or a standard international converter and that makes it convenient since I have a few in my drawer. Roz: I wrote as much as I could with this pen. 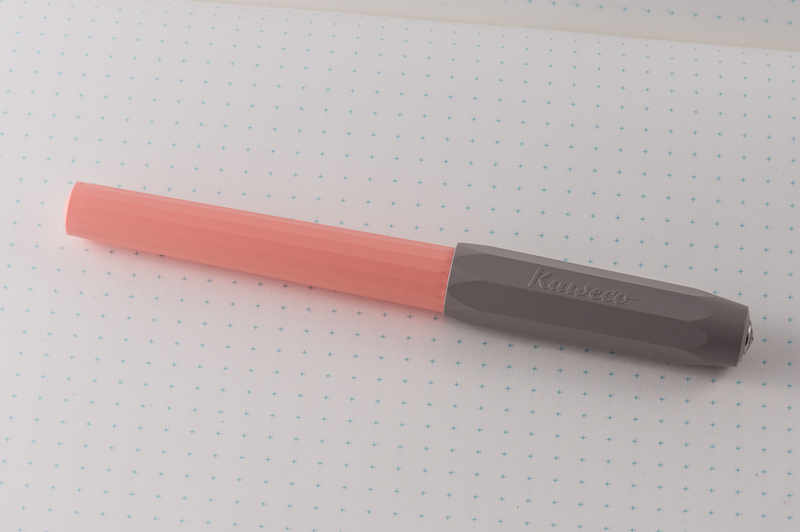 The length of the Kaweco fit my hand nicely, and since it was so light I could write with it posted and unposted. My only (mild) struggle was with the triangular section. 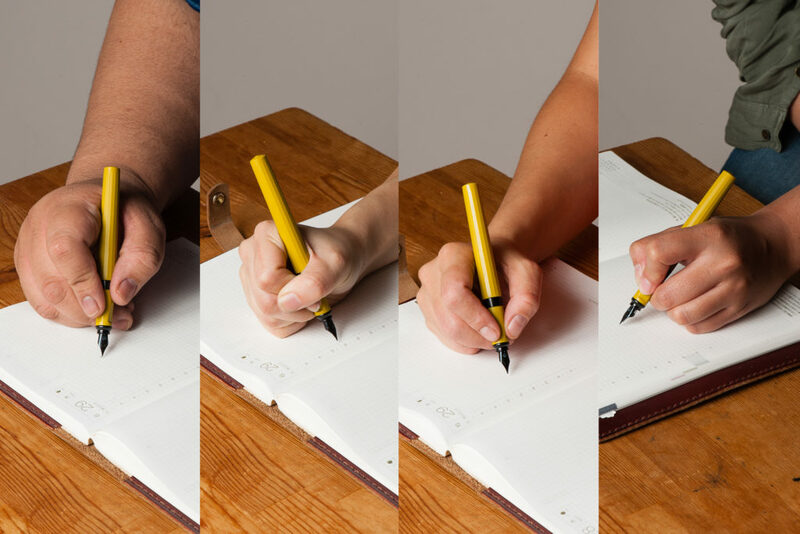 At the beginning, it would take me a bit to work my way to a comfortable grip on the section – after a few times of writing with this pen, I got to a point where only minor mid-writing adjustments needed to be made. 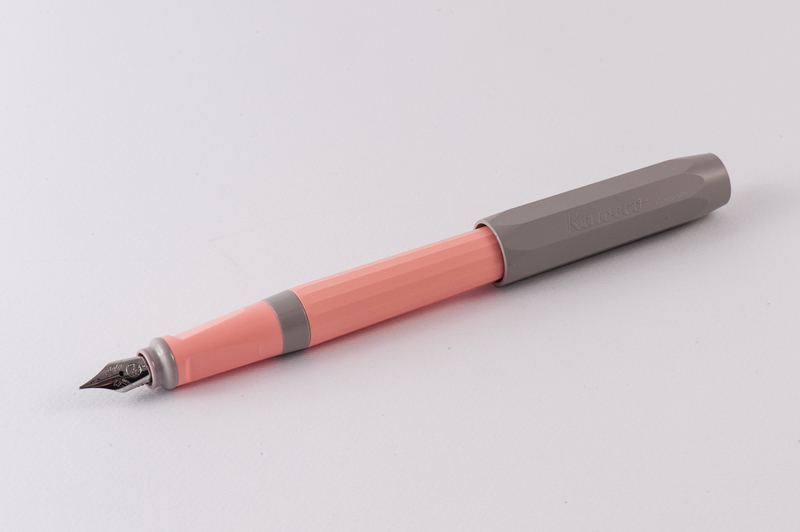 Katherine: I really expected to hate the Perkeo because it has a triangular grip, and the only other triangular grips I’ve used (and stronnnngly disliked) are the Lamy Safari and Jinhao x450, but surprisingly, I quite enjoy the Perkeo. Maybe it’s the shape of the triangular grip, or the angle or some other sorcery, but it’s a light comfortable pen for me. This is the “entry level” Kaweco folks should look at. I’m not sure why you’d buy a Sport anymore unless you want to carry it in your pockets. Or have a really small pen case? 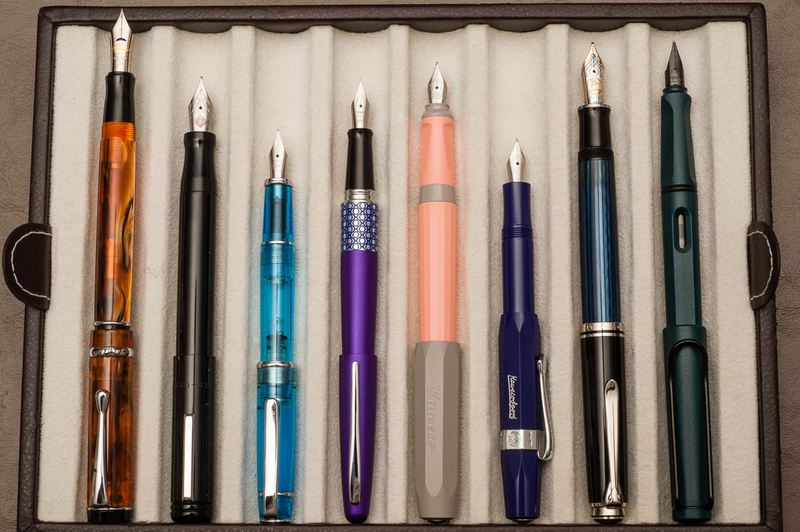 Pam: The Perkeo is pretty light, just like the acrylic Kaweco Sport, which is both an advantage and disadvantage in my book. I find that in pens that are too light, I tend to bear down harder on the paper. 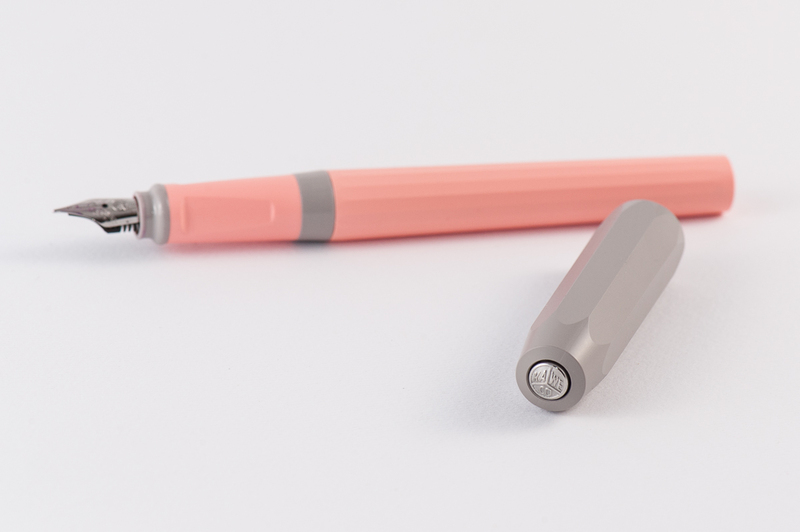 Yet for portability and journaling purposes, the weightlessness of this pen made it really easy to start and continue using with little fatigue (if I don’t bear down). Interestingly enough, the disadvantage of weightlessness that I pinpointed on the Sport, was offset by the length and size of the Perkeo. It was a joy to write with. The triangular grip didn’t bother me very much since the corners were well rounded. I find the triangular grip on the Perkeo to be more comfortable than the Lamy Safari with my grip. Franz: Surprisingly, this is a pen that I can comfortably write with unposted for a long period of time. Posting the cap makes it a little long but the added weight definitely makes it better though. The Perkeo’s section is approximately the same width as the barrel and this let me grip the pen wherever I found comfortable. My fingers naturally landed right on the transition of the triangular grip as it ends toward the top of the section. I enjoyed approximately 20 minutes of writing on my journal and my hand did not cramp at all. 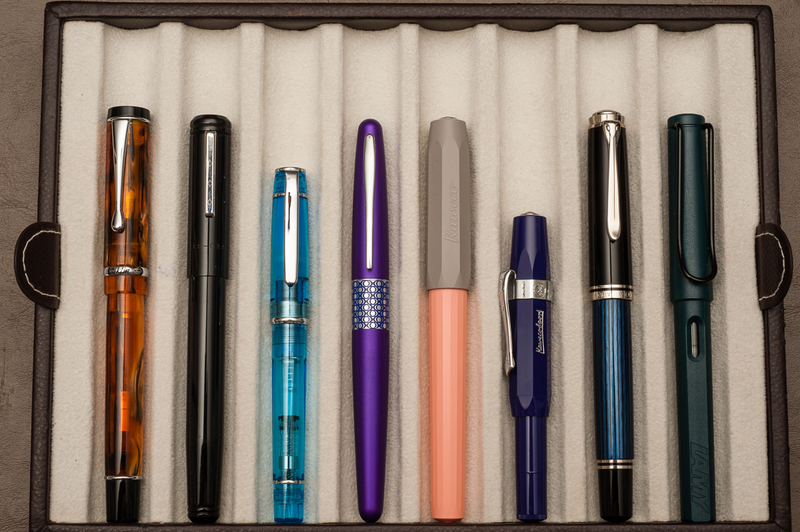 Roz: I kept the Kaweco in a Nock Lookout case and it did great! I actually did use it throughout my day, the lightweight feel of the pen made it easy to grab and made quick notes. Katherine: I enjoyed this for the few days I carried it. It’s light, durable (yes, I dropped it. maybe intentionally) and the facets make sandwiching it in a notebook pretty secure — no worries about a rounded pen sliding out or shooting out of either end of my notebook (generally not a problem except with the fattest roundest and clipless-est pens though, tbh). And the lack of a fancy finish means it can go in a pocket with keys and come out looking the same! Pam: Other than a clip, this would a great EDC. It doesn’t take much to uncap, it’s a postable pen (no lost caps! ), and light! 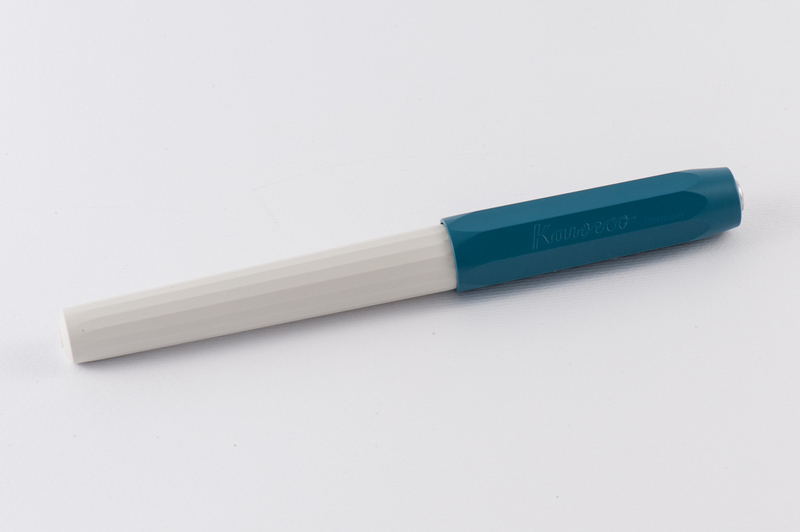 Again, some see the weight as a disadvantage, however, the construction of this pen should be able to stand up to a trip to the washing machine. Ink stains not withstanding. Franz: Using the Perkeo at work for 2 days was quite nice. It’s a no frills kinda pen that just wrote which is what an Every Day Carry pen should be. I placed the pen in my dress shirt pocket and for most of the time, it stayed upright. The length definitely made it easy to grab and not fish out of the pocket like a clipless Kaweco Sport or something similarly sized. The facets on the cap made sure the pen did not roll on my desk. And even if the pen was open and cap unposted, the pen did not roll away as long as I place it on the desk gently. The snap-cap allows for quick usage when needed and provides a positive snap when you want to close it. 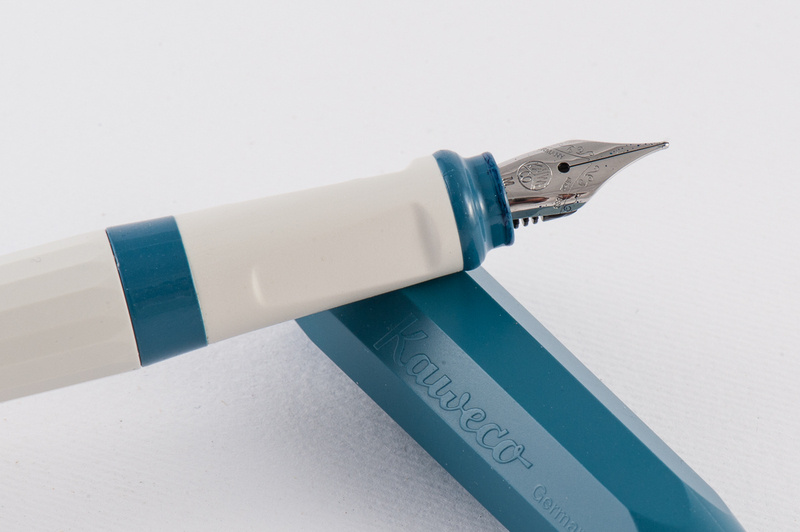 The fine Kaweco nib was suitable for the not-so-stellar copier paper found in our office. And as Katherine described above, it passed the durability field test. Two thumbs up! 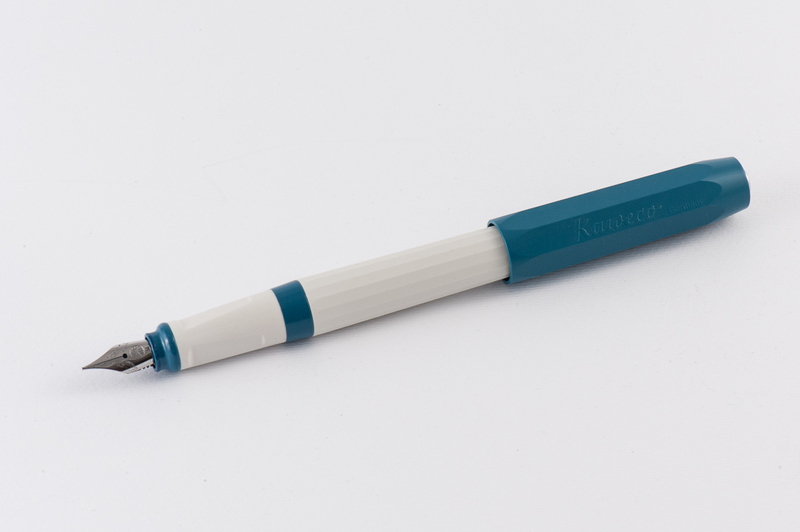 Roz: I think the Kaweco is a really fun pen and I enjoyed trying it out. It was an easy writer (after some adjustments) and it fit my hand size quite nicely. Pam: Honestly, the pen is a GREAT example of a starter pen for those who want to try out a Western sized nib. For the price, the design and the nib performance, the Perkeo is a contender to be a great starter pen. Will it surpass the Lamy Safari or the TWSBI Eco? Maybe not, but depending on what you are looking for, why not try the Perkeo? 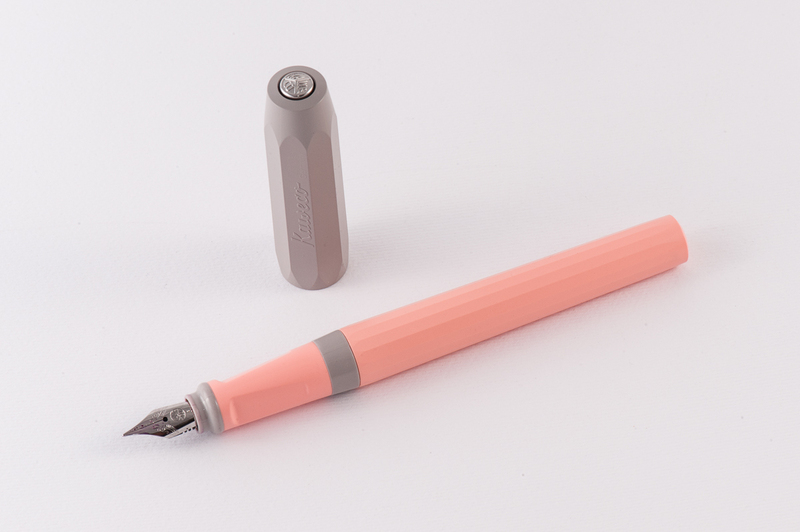 Franz: The Perkeo joins the ranks as one of the recommended starter pens. The only thing to consider is the fact that a converter is not supplied with the pen and is an additional expense. But hey, the Lamy Safari and/or Al-Star does not come with a converter either. I love that the Perkeo takes a standard international one! Thanks, all – that was a very good review. Classic case of a pen that I might not come across and might not consider, but this review covered all the angles. I am always looking for good starter pens to recommend and I’m definitely going to pick one up to try myself. Thanks to Franz for tipping me on IG to come look at the size comparison to the Sport. Quite a difference!